Two days after getting roughed up by a one-loss Arizona team, Montana turned the tables and played the heavyweight in a convincing 69-47 road win at Grand Canyon on Friday night in Phoenix. Trailing 26-24 late in the second quarter, the Lady Griz (4-3) scored the final seven points of the first half, then shot 51.6 percent in the second to pull away and get their first road win of the season. All five starters scored in double figures for Montana, which did almost everything right, outside of some cold shooting to open the game. The Lady Griz had just nine turnovers and were +12 on the boards. Friday’s game ball should be awarded to Taylor Goligoski, who was just 2 for 12 in Montana’s previous two games. She scored a game-high 13 points, but it’s when they came that was most critical. 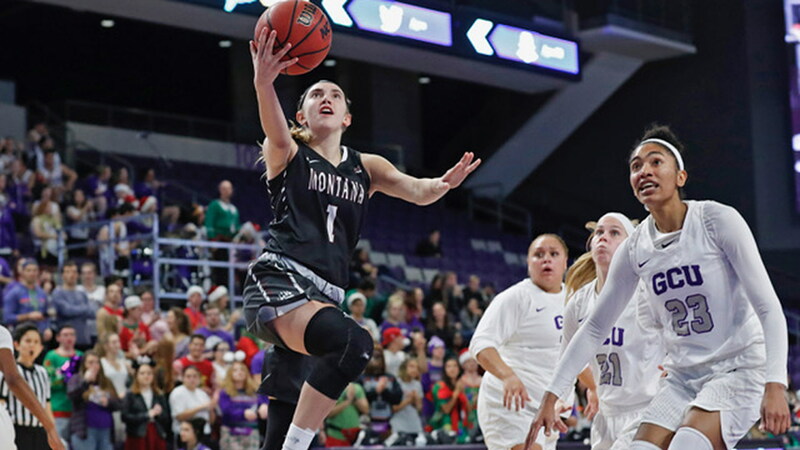 With Montana and Grand Canyon (2-5) trading baskets through the game’s opening 18 minutes, Goligoski scored twice in 45 seconds late in the second quarter to give the Lady Griz a lead they would never relinquish. Gabi Harrington followed with a 3-pointer, right before the first-half buzzer, to send Montana to the locker room with a 31-26 lead. “We needed those big buckets by Taylor. We were struggling a little bit,” said Schweyen. If Goligoski got the game ball, it was Emma Stockholm who made the play of the game. With Montana leading by six, 35-29, early in the second half, the junior rebounded a missed shot and laid it in, all in one motion while in the air, like she was casually finishing a layup. It was a play that was a microcosm of Stockholm’s early-season breakout, and it seemed to spark her team. Soon it was 50-34, then 62-39. She would finish with 11 points and 10 rebounds, her second double-double in three games. After opening the game going 4 for 14 in the first quarter, Montana warmed up in the second, then turned it on in the third, hitting 10 of 17. The Lady Griz finished at 47.5 percent, their best shooting effort of the season against a Division I opponent. “I thought we had a lot of good looks in the first half that just didn’t go down,” said Schweyen. “It was encouraging to see those go down in the second half. In Montana’s three losses this season, the Lady Griz turned the ball over 20 or more times, including a season-high 22 in Wednesday’s 49-point loss at Arizona. On Friday the Lady Griz gave it up just nine times, a season low. Katie Mayhue finished with 11 points, five rebounds and five assists. Jace Henderson had 12 points, six rebounds and seven assists, a team high, giving her 23 over the last four games. She has 31 on the season, second on the team behind only point guard McKenzie Johnston. “She had some more beautiful feeds tonight,” said Schweyen. “You don’t always see your center leading your team. That’s an awesome stat to have. Johnston, broken nose and all, wasn’t going to sit this one out and finished with 10 points on 5-of-9 shooting. She added four rebounds, three assists and a steal. And played a team-high 34 minutes. Of course she did. Gabi Harrington added eight points off the bench. Montana will have more than a week off before facing Washington in Seattle on the opening day of the Husky Classic on Saturday, Dec. 15.